French Limestone flooring in Limeyrat, is a solid choice. “Limeyrat” French Limestone, is a gorgeous warm gray stone that is both interesting and enduring. The image above is a beautiful Limeyrat flooring tile with a brushed finish and a shotblasted, brushed, chipped edge finish for a residence in California. 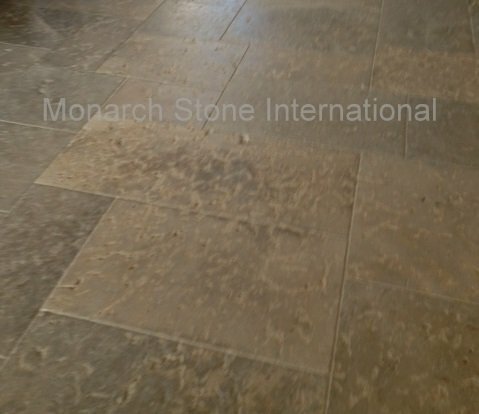 French limestone flooring comes in a tremendous variety of stone types, a wide range of colors, density and durability. Names are sometimes difficult to pronounce and often are changed from its original French stone name (Dalle de France or Dalle de Bourgogne for example). This can be challenging for a consumer to know exactly what they are purchasing therefore, its important to work with a a stone expert such as Monarch Stone International, who is well educated and connected in the French Limestone industry and has the knowledge to assist in selecting the most appropriate type for your living or working environment. A custom French Limestone stone floor often begins with large blocks of stone that are quarried and then transported to factories where they are cut into thin slabs. The slabs are then cut into individual tiles. Veining, crystallization and even fossils may appear in some, but not all of the tiles. This type of variation is inherent with natural stone and adds to the elegance and charm. Natural stone evokes an enduring feeling of warmth, stability, and permanence. It will never fade, and the color won’t change if it is chipped or damaged. Real natural stone is an investment, and will add greater value to your home or commercial project. Visit our French Limestone Flooring gallery for photos of the beautiful French Limestone flooring and the options we can provide!